The station enjoyed a short, new lease of life during the 1939/45 war because its proximity to R.A.F. Watton and army units made it an important distribution point for military equipment. 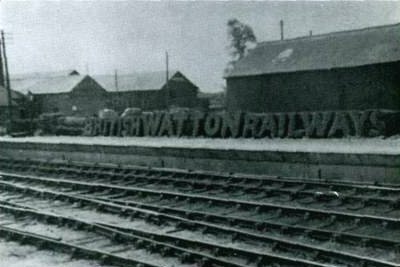 During their stay in Watton the American Air Force extended the facilities by laying down new rails, points and hundreds of square yards of concrete. it will come as no surprise to anyone to know that this area was promptly renamed "Texas". with a remarkable cut out shape of an engine at one end. This hedge was a feature of Watton station, much admired, much photographed, and it was kept in perfect condition because Ernie, for many years after he retired returned to cut and trim and care for his creation. Sadly, the hopes and dreams of a new future did not materialise. The last train passed over the points and through the gates, and the station was sold for factory development. The buildings, platforms, signal box and lines all vanished. And with them, as if it had never existed went Ernie Fagg's hedge.